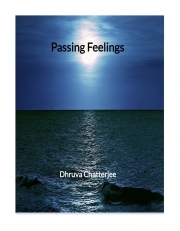 Description of "Passing Feelings (eBook)"
The poems in this book were originally not meant to be a part of any kind of group. They were written in an arbitrary manner at different points in time by the writer encompassing a time span of approximately three years. The writer usually visualizes an imaginary subject as best as he can and then tries to put himself into his or her shoes to gather the emotions and mannerisms of the subject before the first line of the poem starts. Three poems however have a special place in his heart, those that are part of the "Apple of Eye" series, which were inspired by his entry into fatherhood. The poems are motley in nature; some dark, some light, while most dealing with life and its intricacies. If anyone reading this so-called collection is able to visualize the scene which the poem depicts, the writer would know that his mission was accomplished. After all, what better reward than to have our words ignite someone's imagination, eh! The writer has a computer background. He spends most of his time around computers (and family). His engagement with the world of the arts is limited to watching a classic movie and reading a novel every once in a while. He is no great writer, to say it in plain terms. But he does like taking the liberty of observing people and playing with words sometimes. That's him. Reviews of "Passing Feelings (eBook)"